New Blue Plaques For The Heritage Trail In Warminster. Twenty new blue plaques have been put up in Warminster to highlight the town’s heritage. The plaques are mainly on historic buildings, and include the Chapel of Saint Lawrence (founded in the early 1200’s), and The Old Bell, Warminster’s oldest surviving inn, recorded as The Bell as long ago as 1483. The public can download a copy of the trail map, which also includes brief notes on the historic significance of each site. Warminster Town Council has taken over responsibility for the heritage blue plaques, many of which were originally installed by Warminster Civic Trust. Over the years the condition of many of the plaques became quite poor and so it was agreed to audit the condition of the plaques with a view to replacing those that were in the poorest condition. The new plaques have already brought much praise from those who have seen them, for the clarity of the wording and the quality of the signs. The wording on some of the plaques was changed with the assistance of former members of Warminster Civic Trust and members of Warminster History Society, to make sure that they were as accurate and up to date as possible. The old blue plaque at Chinn's Court, Warminster. 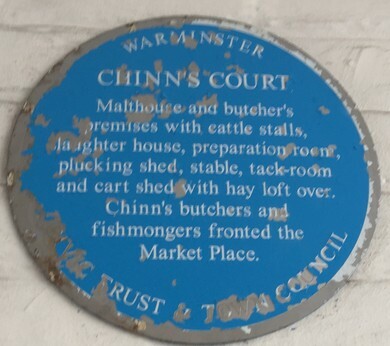 The new blue plaque at Chinn's Court.